Hey iNFLUX PC Repair friends! Looking for a repair on your laptop? Let us know what you need and we’ll take care of it for you. A couple weeks ago we received a gaming laptop that definitely had seen better days and needed multiple repairs. 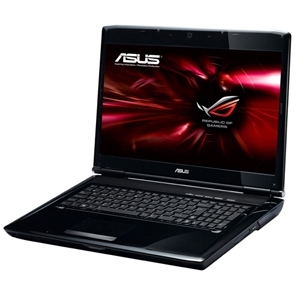 The Asus G72Gx originally came with a 17″ in LCD screen, 1GB of dedicated graphic memory, 500GB hard drive, and 6GB of RAM. This was clearly designed for gaming use and is still a decent laptop today. Why not repair it, right?! Our friend Daniel, brought us the laptop after it accidentally dropped out of a parked vehicle. Fortunately, he had insurance on it. We worked with the insurance company to justify the time and materials required for the repair and it was at very little cost to him. This laptop had so many things wrong with it, probably more than we have ever seen on a single device within the last 10+ years that we’ve been in business. The LCD screen was only showing black and gray; however, the attached external monitors worked fine. The laptop would not completely boot and sometimes froze at the windows boot logo. The Keyboard back-light was intermittent and sometimes wouldn’t register that keys were being pressed. The exterior had cracks in the plastic, mainly the bottom case and screen bezel. This was strictly cosmetics though. WiFi was not working. The laptop knew the card was attached but the radio would not enable. DVD burner was not working. Again, Windows knew the drive was there; however, CD’s and DVD media could not be read or written. The battery would not keep a charge. 500GB Solid State Hard Drive. Once we swapped the LCD panel and bezel we could then see what was going on with the boot up process without having to use an external monitor. The bottom case swap fixed the gaps in between palm rest and bottom case. The battery swap kept the device mobile since it would now keep a charge. We put in a 500GB Solid State Hard Drive in addition to his 500GB spindle drive; now he had 1TB of hard drive space to work with. Once booted, we determined that it was best to go ahead and do a clean install of Windows 8.1. Everything was going fine until we updated the BIOS using Asus’s update tool in Windows. The bios is a a set of computer instructions in a firmware that control input and output and if it goes wrong the laptop becomes a brick. This is the first time in 10+ years of updating BIOS’s that we actually witnessed a no boot failure after an updating. Short version of the story, we ended up ordered a new motherboard for him. The BIOS update on the new motherboard went perfectly, phew! Once the new motherboard was in, we were back in business. We finished up all the Windows 8.1 update and a couple days later, Windows 10 was released. The Windows 10 update was simple and quick and fixed some other weird operating system issues. We upgraded a few things to bring the laptop up to date. First, a brand new SSD. The solid state hard drive (SSD), is the best upgrade anyone can pay for. We’ve been turning 5-7 year old laptop into scream machines. This laptop allows two internal drives so we installed the Samsung 850 Evo SSD as his primary drive that has the operating system (Windows 10), his applications, and primary data on it. The 500GB spindle drive was installed in the secondary slot and can now be used for data that is not frequently accessed or even as a backup drive. This is the best setup for high performance. We also upgraded him to Windows 10 from Windows 8.1. I guarantee this laptop is at least 30% faster than the first day he got it. It’s was great to see this shamble of a system go through repairs to become such a great computer again. Now then, what could be so wrong with your laptop? Our laptop repair is $120 flat rate + at cost parts; love your laptop again!